The Sunshine Coast’s public transport centrepiece, Noosa Junction Station, was one of eleven entries from 32 submissions to receive a commendation at the recent Australian Institute of Architects Regional Awards held on the Sunshine Coast. The April 28 event honoured architectural design in the region, ranging from eco-friendly housing, through to commercial and public utility projects. Designed by Bark Design Architects, the bus station was commended for its contemporary design. 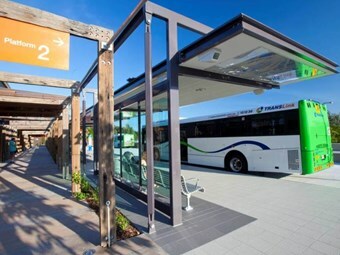 The $10 million bus station was a jointly funded project delivered for TransLink and the Sunshine Coast Regional Council. TransLink CEO Neil Scales says the accolade was well deserved. "In terms of design, the Noosa Junction station really is quite remarkable in the way that it manages to capture the vibrant and diverse character of the Noosa area," Scales says. "Noosa is such a significant destination for tourists and locals and with its contemporary design the bus station really helps it stand out as a welcome gate for the entire region," Scales says. "The station is a great example of integrated transport planning, playing host to nine of TransLink’s urban routes, as well long-haul and interstate bus services run by other operators." Scales says the Noosa bus station was designed to provide easy access for pedestrians and cyclists, featuring upgraded footpaths and cycle storage. The jury at the Australian Institute of Architects awards commended Noosa Junction bus station for providing an ‘unexpected oasis from the busy adjacent street’, also stating that it created a ‘backdrop for a new, vibrant public precinct’. Sunshine Coast Council's Executive Director for Infrastructure Services Andrew Ryan says the project would help increase public transport use in and around the Noosa region. "The new bus station at Noosa Junction is a key component of Sunshine Coast Regional Council’s transport strategy," Ryan says. "The opening of the new station was the catalyst for improvement to nine local bus services in the region resulting in improved passenger services. "This is just one of the ways council is working with TransLink and local businesses to create a sustainable future for our region." Although the Noosa project was highly regarded, the piece of public architecture to win one of three top awards was the ‘Caboolture Hub’, a 5000 square metre floor space comprising a library, regional art gallery, learning centre and cafe alongside the Caboolture Town Square. The hub project Building provides a unique community facility designed to offer the people of Caboolture and the Moreton Bay Region a centre for local culture, art, history and learning.